On a Western saddle, rigging positions are commonly referred to as "full," "7/8," and more. Here is a quick breakdown of what those common rigging positions mean. 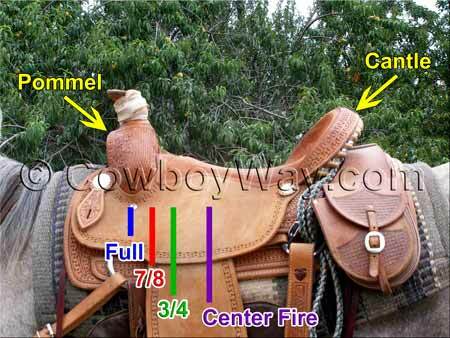 You might also like: Parts Of A Western Saddle and How To Measure A Western Saddle Seat. Full Rigging: The front cinch position is the full distance from the cantle to the pommel. This puts the front cinch directly beneath the pommel of the saddle. 7/8 Rigging: The front cinch position is 7/8 of the distance from the cantle to the pommel. This puts the front cinch a little farther back than a full rigged saddle. 3/4 Rigging: The front cinch position is 3/4 of the distance from the cantle to the pommel. This puts the front cinch a little farther back than a 7/8 rigged saddle. Center Fire Rigging: The front cinch position is (approximately) centered between the cantle and the pommel. Saddle rigging positions, as described above, vary between saddle makers. In other words, one saddle maker's "full" position (or any of the other positions) might not be in the exact same place as another saddle maker's. Single Rigged: This means there is a front cinch, but not a back cinch (sometimes called a "flank cinch"). The term "single rigged," by itself, does not let you know the position of the front cinch (full, 7/8, etc.). Double Rigged: This means there is a front cinch and a back cinch. The term "double rigged," by itself, does not let you know the position of the front cinch (full, 7/8, etc.). Full Double Rigged: This means there is a front cinch and a back cinch, and that the front cinch is in the "full" rigged position (the full distance from the cantle to the pommel).